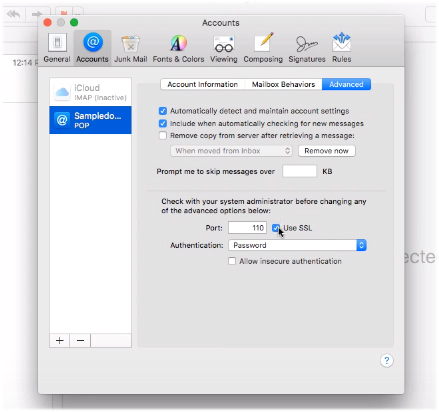 Mac Mail, also known as Apple Mail, is an email client included free with all Apple computers (as well as Apple mobile devices such as iPhone, iPad and Apple Watch). 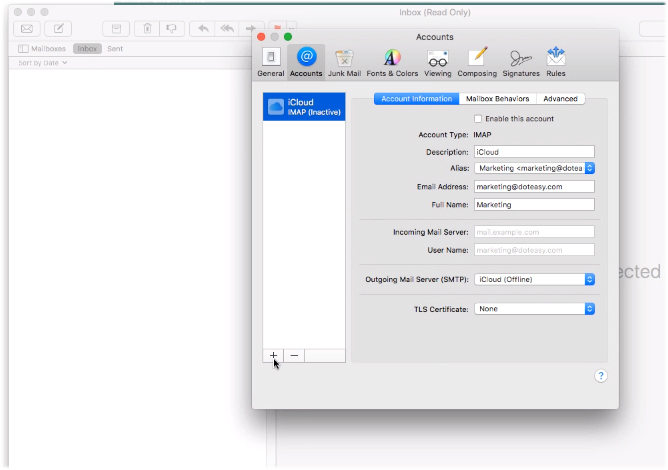 This article will show you how to configure the Mac Mail application on your Mac computer to access your Doteasy.com domain emails. On your Mac computer, Mac Mail is the stamp icon on the dock. If you don’t see it on your dock, you can search for it on your applications folder. 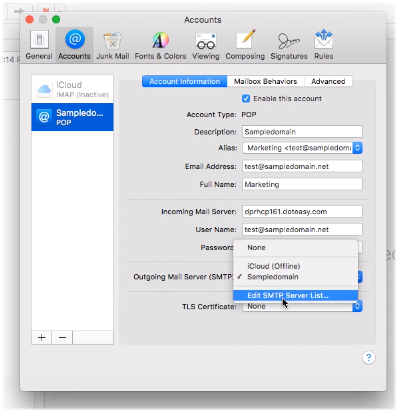 Like all other email clients, when using Mac Mail, you are essentially downloading a copy of your domain emails from the mailserver to your computer (or any device using Apple Mail). One benefit of using an email client is that once an email is downloaded onto your computer, you can access it anytime you want, even when you don’t have Internet connection. Another great benefit of using Mac Mail is that if you are also using an iPhone, iPad and/or Apple Watch in addition to your Mac computer, you can sync your domain emails across all devices. 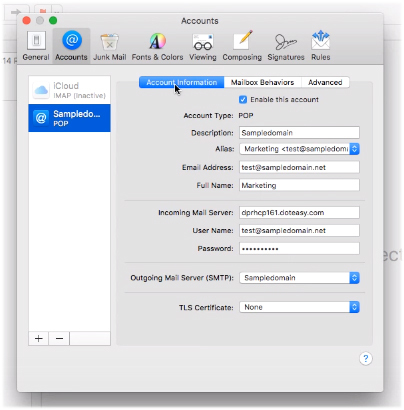 And if you don’t want to re-enter your email account settings by hand, you can use iCloud to sync mail account information (ie. username and password) between devices. 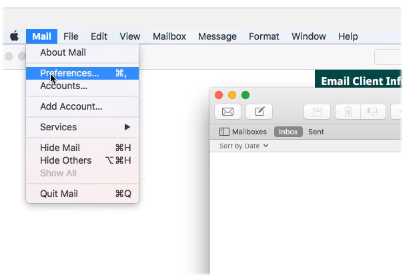 Click on Mail on the dock of your computer. Click on Mail and select Preferences. On the Accounts tab, click +. 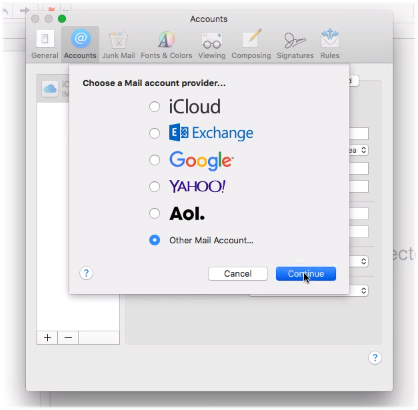 Select the Other Mail Account… option and click Continue. Enter your Name, domain email address and password. When ready, click Sign In. On the next screen, enter your domain email account username. Your domain email account username is the same as your domain email address. 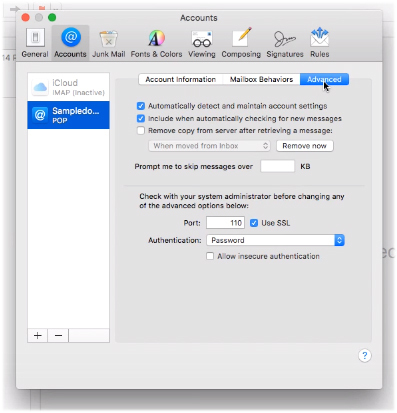 From the Account Type drop-down menu, select the desired protocol: IMAP or POP. Under Incoming Mail Server, copy and paste the incoming mail server settings as per your Email Client Info. Under Outgoing Mail Server, copy and paste the outgoing mail server settings as per your Email Client Info. When ready, click Sign In. 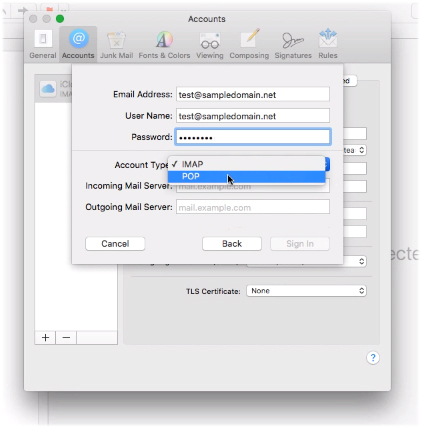 Your domain email account is now added to your Mac Mail client. Make sure the Enable this account option is checked. Next, you will need to configure a couple advanced settings. Click on the Advanced tab. 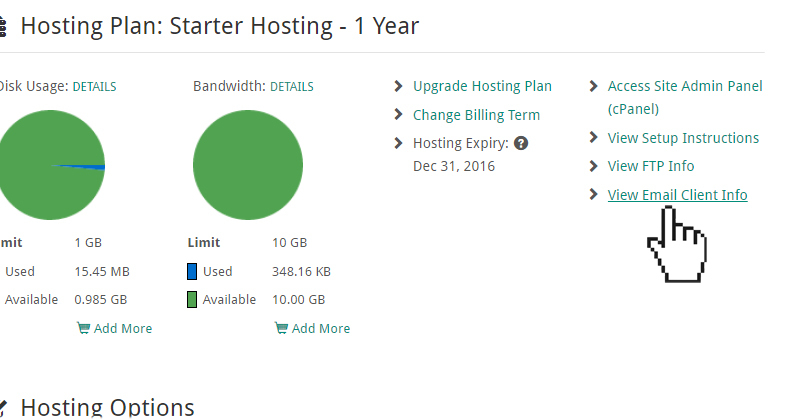 On the Advanced tab, check the port and SSL options. Because we recommend using the Secure-SSL option, check the Use SSL box. Also make sure the following options are unchecked. When ready, close the window and save your new settings. Next, you will need to configure the outgoing mail settings. Open the account information tab. From the Outgoing Mail Server (SMTP) drop-down menu, select Edit SMTP Server List. 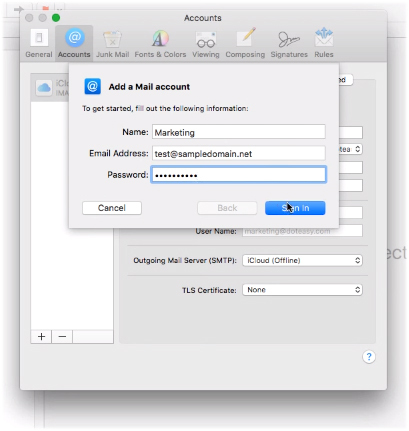 Your Mac Mail setup is now complete and you can use it to access your Doteasy domain email account. 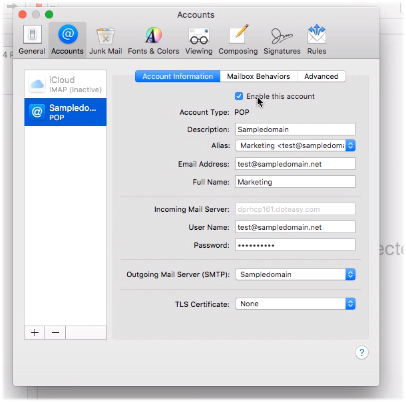 If you want to use Mac Mail to access another domain email address, simply repeat the setup process outlined above for each account you want to add to your Mac Mail client. 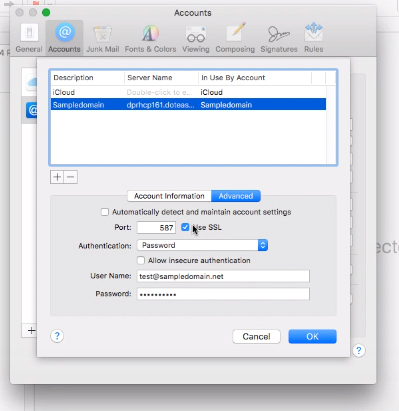 Mac Mail automatically checks your domain email account(s) periodically for new email. 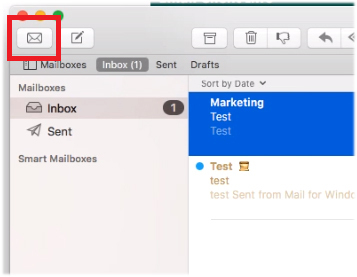 To manually check for email, click the Get Mail icon. To view an email message, select it from the list of messages on the left column and the message body will appear on the Mail window. This completes the Mac Mail configuration process. If you have any questions about this article or our video tutorial, or if you should run into any problems, please do not hesitate to contact us. You can reach us by email, phone and live chat. We also offer a call back service.